HomeMenuNew Website Launch for The Meating Place! The Meating Place is proud to announce the launch of our new website! This will be a space to connect with our customers and let you learn more about what we do and how we do it. Peruse our menu and find out what today’s specials are. 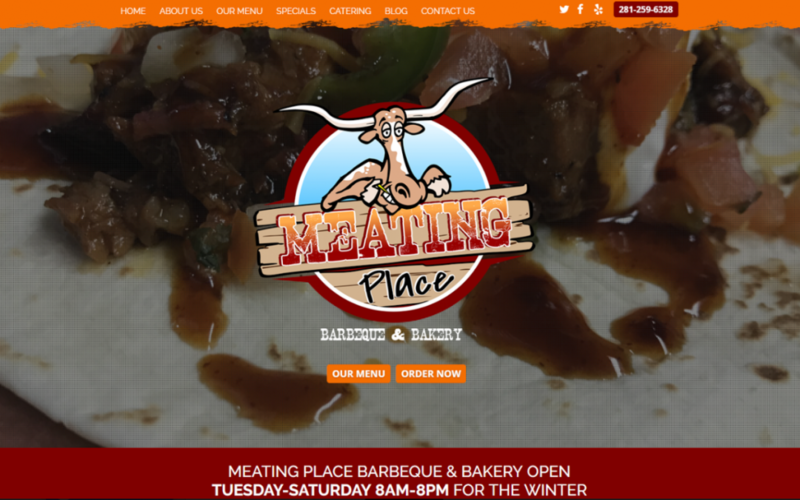 The Meating Place is a brand new local barbecue restaurant in Pinehurst, Texas. Owner and Chief Pitmaster Buddy Adams has been barbecuing his entire life since he was old enough to light a match and split oak. The restaurant is decorated with memorabilia and antiques that belonged to Buddy’s family and all hold special meaning. It’s truly a family owned and operated affair! Take a few minutes to explore our websites and learn more about our process. Browse our menu, take a look at catering options, or find directions to our establishment. Learn more about who we are, and what sets us apart from other restaurants. Our menu includes savory meat, delectable sides, and freshly baked goods. We use only the highest quality meats, including our certified Black Angus (CAB) briskets. Meats reach tender perfection in a specialty pit we made ourselves called the 360 Smoker. Enjoy ribs, pulled pork sandwiches, tacos, macaroni and cheese and so much more! If you’re craving something sweet, end your meal with a freshly baked treat baked by chef Hanna Hesse. Tuesday thru Friday The Meating Place offers specials at a discounted rate of 15% off. Enjoy Taco Tuesday, Rib Wednesday, 3 Meat Thursday and Frito Pie Friday. We also offer several regular specials, perfect for a quick work lunch or indulgent family dinner. Treat your guests to savory mouth-watering barbeque with our home-cooked sides and delicious homemade desserts. We offer full-service catering and delivery, with a variety of menu options to choose from. With unique, homestyle meals, it’s an unforgettable culinary experience. The Meating Place BBQ & Bakery opened its doors in July 2017. The Meating Place BBQ & Bakery has quickly earned the title of Best Barbecue Restaurant in the area, and we’re proud of our reputation. Buddy’s many years of experience are evident to anyone who tastes a cut of perfectly cooked meat. Our goal is to make delicious food for friends and families to enjoy together. We truly believe that The Meating Place BBQ & Bakery will become a legendary Montgomery County establishment. With high-quality ingredients, innovative preparation and a state of the art smoker, it’s a one of a kind BBQ experience. Contact Us and or stop in and taste for yourself!